CD45 is a single chain transmembraneous glycoprotein of the PTP family. It has a highly glycosylated extracellular domain, a single transmembrane segment, and two tandem intracellular catalytic domains. The catalytic domains are involved in src and JAK kinase signaling and interact with antigen-receptor complexes, constituting an essential regulator of T and B cell signaling. Alternative splicing gives rise to at least four CD45 isoforms. With the exception of mature erythroid cells, CD45 isoforms are expressed in all the cells of the hematopoietic lineage. 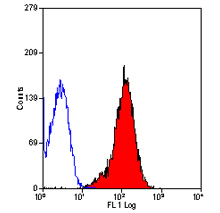 Bio-Rad has a comprehensive range of anti-CD45 antibodies as highlighted below. Choudhuri K, et al. (2009) Peptide-major histocompatibility complex dimensions control proximal kinase-phosphatase balance during T cell activation. Mortarino M et al (2009) ZAP-70 and Syk expression in canine lymphoid cells and preliminary results on leukaemia cases. Tominaga M et al (2010) Flow cytometric analysis of peripheral blood and tumor-infiltrating regulatory T cells in dogs with oral malignant melanoma.